I have to admit that infusing oils with herbs is a very satisfying experience. Why? Because, when I use the infused oils to make a product, I know I am using the best ingredients possible, resulting in a quality product. My customers tell me things like: “I LOVE the Calendula soap! My face cleared up and is softer and healthier than ever.” “The Calendula/Comfrey balm is amazing! It cleared up my nephew’s rash almost over night!” I know they are small things to some. But to others, they are huge. Links to herbal information may appear when I specify an herb, for your convenience and education. Be informed! Please let me know if you have any questions here. 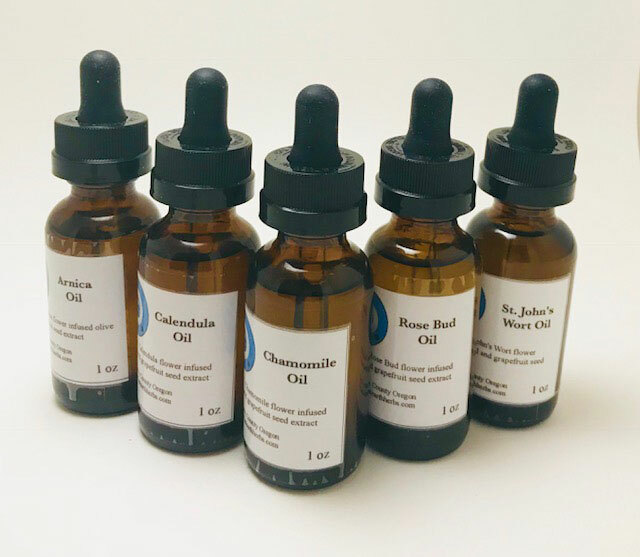 Many customers refer to my Calendula flower-infused Lip Balms as “The Best Lip Balm EVER!” So much so, they often purchase multiple tubes at a time and share them with their friends. I believe it’s a natural response to want share with others when you find something you really love. Lip balms are made with Sweet Almond oil infused with Calendula flowers in two flavors, mint or vanilla, in a 0.15 oz tube. I’ve mastered that “sweet spot” consistency so you won’t have to “rub your lips off” to put it on. 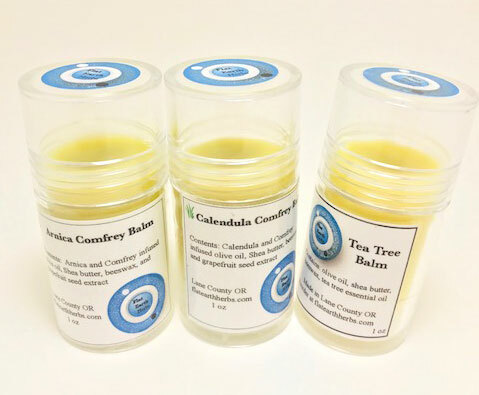 Calendula Comfrey Balm is what you want in your medicine cabinet, always. The beneficial constituents of Calendula flowers and Comfrey leaves are infused into olive oil to produce this amazing wound dressing. Arnica Comfrey Balm can be your best friend when it comes to managing a painful bonk, bump or twist or bruises. This type of injury rarely happens at a convenient time. Do not apply to open skin. Tea Tree Balm gets a lot of use in our medicine cabinet. Great for moisturizing dry cracked heals after a nice soak, or as a good overall foot massage balm. Primarily, I make herb-infused oils to use when making my balms and soaps. However, there are times I prefer to use an herb-infused oil, instead of a balm. For example, I use Calendula oil directly on burns. So, I decided to offer you that choice, too. I infuse olive oil with the herbs and package them in 1-ounce Boston round amber glass dropper bottles. Choose from Arnica, Calendula, Chamomile, Rose Bud and St. John’s Wort oils.